Posted on September 27, 2011 by Kaci H.
I have received many questions from students asking “What is hydrography?”. According to the International Hydrographic Organization, hydrography is “the branch of applied science which deals with the measurement and description of the physical features of the navigable portion of the earth’s surface [seas] and adjoining coastal areas, with special reference to their use for the purpose of navigation.” Lets break that word down to find the meanings of the prefixes and suffixes using dictionary.com. Another question I have received is what is a hydrographic survey? Most of the surveys that you may have heard of are used on land. For example, construction workers may survey a site before they start construction, or you may take a survey at school about what types of food you would like in the cafeteria. Any kind of survey is the acquiring of information that is used for various purposes. 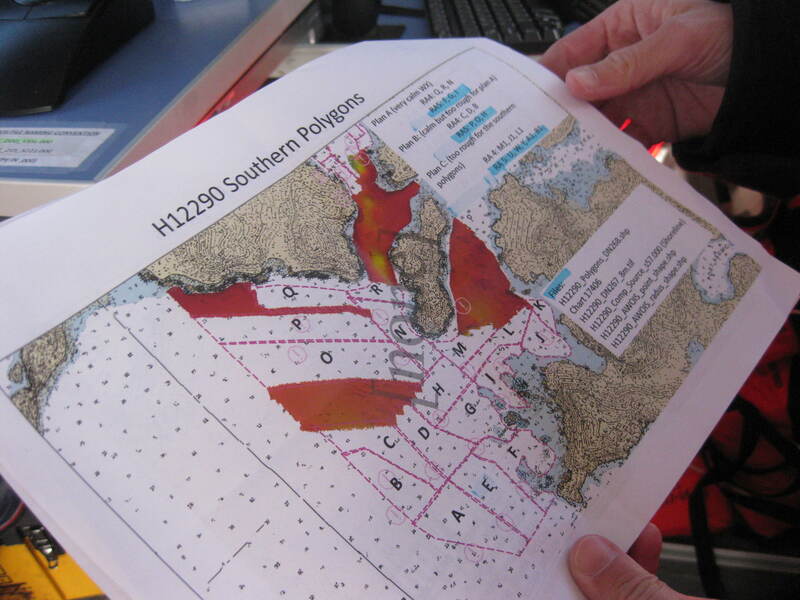 In the case of a hydrographic survey, the technicians acquire and chart information about the sea floor. I was fortunate enough to go out on a survey launch to see that a hydrographic survey is conducted using sonar to look through the water to see what the sea floor actually looks like. 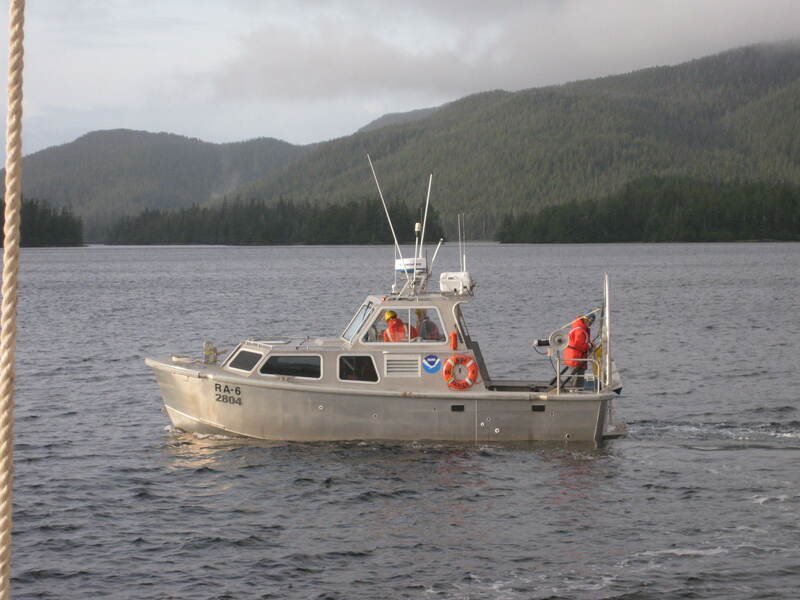 The boat that NOAA uses to conduct the surveys is called a launch. This means we use a large motorboat to get to where we need to go. It costs tens of thousands of dollars a day to operate the Rainier, her launches, and the technology. It is the technology that allows scientists to be able to “see” through the water to map what the ocean floor actually looks like. The first, and most important, piece of technology on the launch that enables us to “see” the sea floor is the sonar. Sonar (SOund NAvigation and Ranging) is the process of using sound waves to bounce off objects we cannot see and then acquiring the return sound to create an image. However, it does get a little more complicated than that. 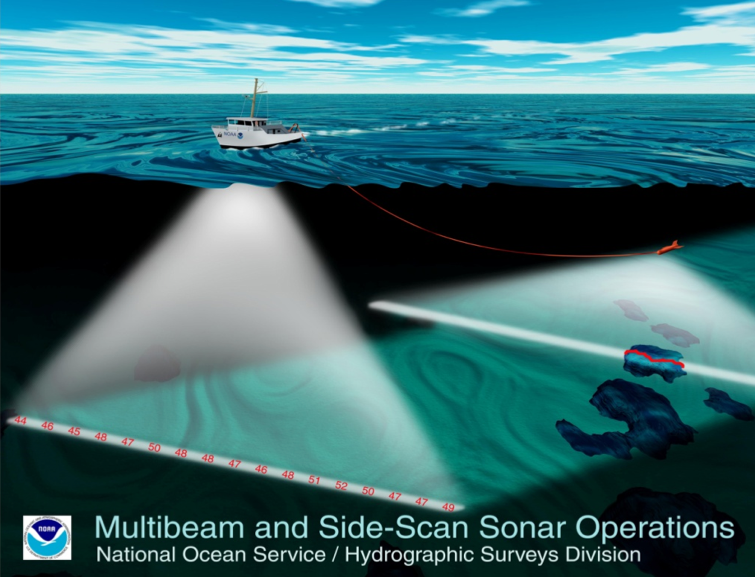 There are two different types of sonar that the NOAA National Ocean Service (NOS) goes into detail about. 2) Passive Sonar – Is a sonar system that does not emit its own signal, but listens to sound waves coming towards it. beams each second. The frequency of the sound waves depends on the depths that we are working in. We worked in waters that were around 50 meters deep so we used the 400 kilohertz frequency. However, if we would have been working in deeper water we would have gone to 200 kilohertz. By lengthening the wavelength the beams can travel into deeper water with less error or scattering. Before we start acquiring data we make sure to have good communication with the coxswain, or driver, of the boat. It is extremely important that there is good communication and that the coxswain can maintain their heading and speed throughout the polygon so that the data can be collected without too many errors. We want to make sure we only go about 6-8 knots so that the sonar echo has time to make it back up to the receiver and we can collect good data. The scientists also conduct a CTD cast before we start and every four hours while they collect data. CTD stands for Conductivity (or salinity), Temperature, and Depth (pressure). 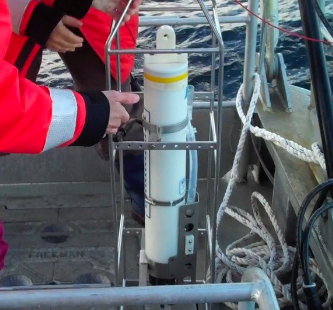 The data from the CTD can be used to calculate the speed of sound through water. All of these factors can cause errors in the survey data so scientists need to collect this information so that the finished product has fewer errors and depths can be corrected from the sonar. Other features that can cause errors in the data are bubbles, vegetation such as kelp, schools of fish, and the type of material that is on the sea floor. For example, if the sea floor consists of a softer material it won’t reflect the sonar beams back as well. To collect the survey data we basically drive the launch back and forth over our assigned polygons with the multibeam sonar. This is sometimes called “mowing the lawn” or “painting the bottom”. When we get to one edge of the polygon we stop logging data, turn around, and make a new swath as close as we can to the previous one and continue collecting data. We cover around 50 nautical miles each day collecting data with the overall goal to collect the best data quality that we can during our acquisition. As we head back to the Rainier all the computer data is downloaded from the day and is later transferred to the plot room. This is where survey technicians add all the other information and make corrections to the data such as tides, vessel motion (POS), GPS, sound velocity from the CTD, and other programs so that the data is as accurate as possible. Technicians still must go through and clean out “noise” which is scattering of some of the data. 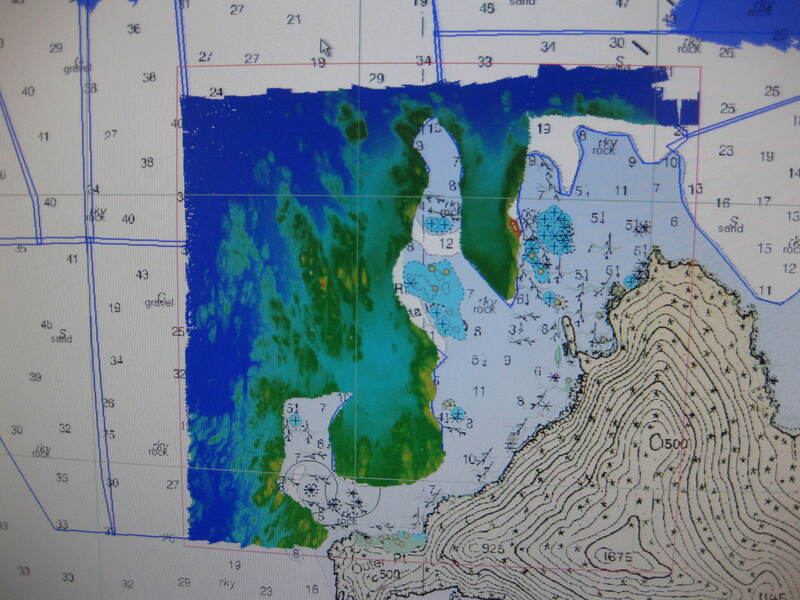 The finished survey chart is sent to the Pacific Hydrographic Branch for post processing and quality assurance. In my last blog I wrote about how math skills are very important not only as a strong skill needed on a NOAA ship, but also as a life-long skill. 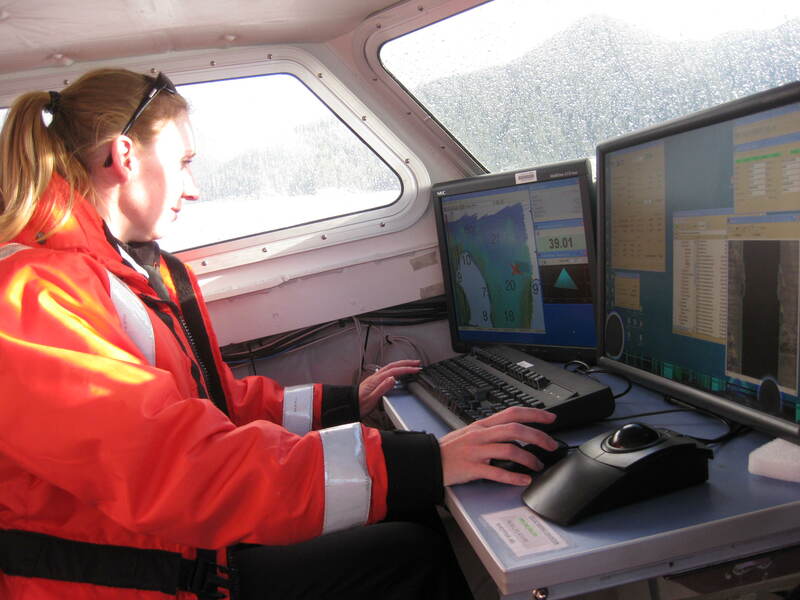 As I continue learning more about hydrography I have also found that computer skills are extremely valuable in this work environment. Most people have basic computer skills to check email and run office programs, but out here it takes a little more. There is quite a bit of training that the survey technicians and the NOAA Corps officers must go through to learn about all the different software that collects data and then using more software to combine them to make the finished hydro chart. Numerous hours of collecting data, combining data, cleaning data and finishing projects all have a significant amount of work done by or at a computer. Everyone from the captain to the junior officers must know how to use it and how to troubleshoot when things don’t work right. It is not as easy as picking up the phone and calling customer service. Minds among the ship must come together to solve problems when they arise. While underway whether it is on the ship or on one of the launches the high seas are always around. At first they made me nervous because I was afraid I would get sick. However, it has turned out to be quite the opposite! Whenever the seas get rough I actually start to get sleepy as we sway back and forth! Usually, we are so busy that there isn’t time to take a nap so I’m learning to work through it. Going along those lines of being busy, there are usually no breaks during the weekends. In most people’s lives the weekend is time to take a break, hang out with family and friends, and sometimes do absolutely nothing at all. Out here on a working ship this is not the case. The NOAA ships have to meet certain deadlines and with some of their past major repairs, time has been ticking away with not much work being done. This means when Saturdays and Sundays roll around at the end of the week we keep on working like a regular day. I have the utmost respect for all of the crew, scientists, and officers that spend their time out here working for weeks straight. It is not an easy lifestyle, but they are committed to it and I admire them and their strength. 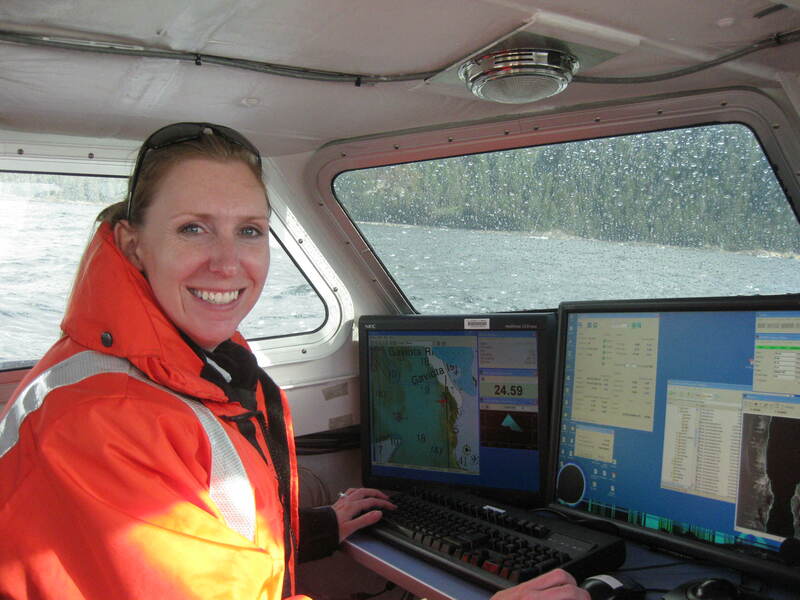 This entry was posted in 2011, Kaci Heins, NOAA, NOAA Ocean Service, NOAA Teacher at Sea and tagged CTD, Hydrographic survey, hydrography, mowing the lawn, multibeam sonar, painting the bottom, Rainier, sonar, swath, teacher at sea. Bookmark the permalink. I miss you all too!!!! I am having fun and learning so much! Glad you LOVED the project I assigned! I know you all will do very well on it. I actually had homemade pizza for lunch today…no anchovies. Seas are very rough today so I hope I don’t lose my lunch! Be good, have fun, and I will see you in a week and a half! Hey Mrs.Heins!Do they have good food on the ship? Yes, they have great food! It is so good I make sure I get on the treadmill every morning! There are three people in the steward department. They are great people and great at what they do! Hey this is Samantha! How is it going? We all miss you a lot. Hope you are enjoying the ship! Bye!!!!!!!!!!!!!!!!!!! Hi, Mrs. Heins this is Ryan and I wondered why hydrographic survey is so important and what it is mostly used for. I hope the rest of your trip is good. The main reason we survey is for ship safety as they navigate through waters. That is all I am going to give you for now. Please read through my blogs and conduct the research for your project and that will help you answer your questions. Its no fun if I do all the work for you! See you in about a week! The food is SOOO good here! It is very healthy too! They have everything that you need from the food pyramid, but because it is so good it is hard to eat just a little bit of everything. I am having a really good time and learning a lot, but I get back on October 8th. This means I will see you at school on the 10th and I’m sure you will be ready to present your project that day! hey Mrs.Hiens i am having so much fun and I miss you Mr.Wallman is really fun an how cold is it out there and have you seen any sharks their I like sea lions and the jellyfish amazing. I’m glad things are going well at school. I miss you guys too! I haven’t seen any sharks, but I have seen the sea lions. Why is the technology called POS top secret? 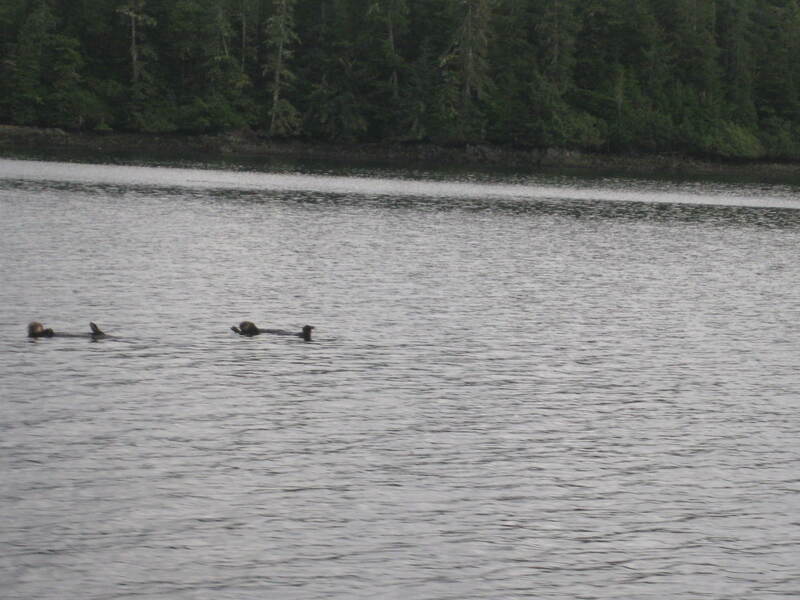 Did you see any sea otter pups? They are so cute. How did you see the sea urchins? It is what is inside the POS that is top secret. It has very accurate inertial motion sensors inside of it and that is about all I can say. I haven’t seen any sea otter pups, but the urchins were pretty cool. It was low tide so I was able to see the urchins and lots of sea stars in the tide pools!